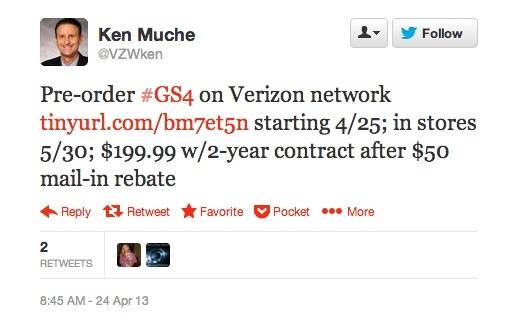 According to Ken Muche, a Verizon PR rep, the Samsung Galaxy S4 will arrive in stores on May 30 for $199 on 2-year contract after a $50 mail-in rebate. He also confirms that pre-orders for the device start tomorrow, but for the first time in any sort of official capacity, we now have a date to mark on our calendars. Why on Earth their variant arrives a month later than the rest of the world is beyond us, but I’m sure they needed to “test” it further. He didn’t specify the version of the phone that is priced at $199, but we would assume it’s the 16GB model. I have to admit, though, that I’m surprised to see them attach a $50 mail-in rebate – I thought we got rid of those years ago? Be sure to check out our exhaustive Galaxy S4 review.